This amazing recipe is incredibly easy to make. 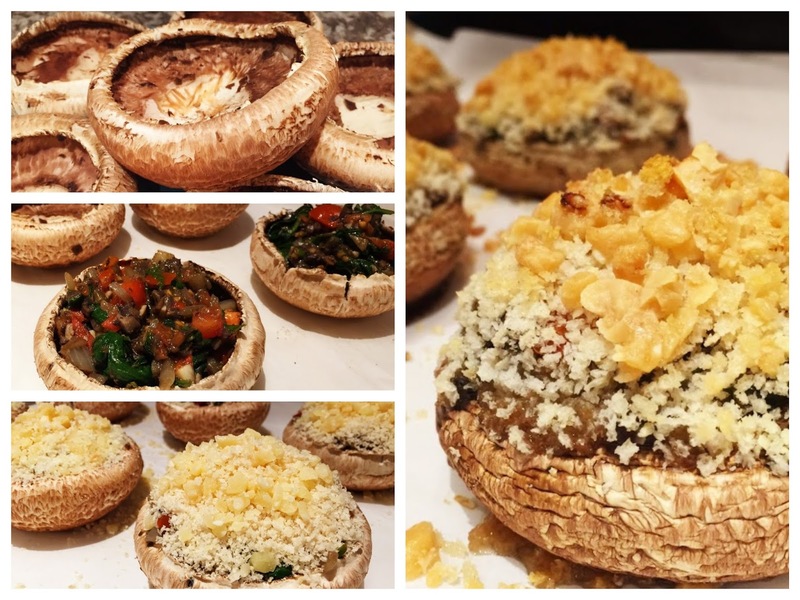 It has a whole range of textures, from the firm earthy mushroom, the soft and creamy spinach filling and what everyone loves, the crunch of the panko. It makes a hearty appetizer, but today, it was our whole meal with a side of salad. It's very versatile; get creative with the stuffing and season it Mediterranean style or Italian style. Of course, one could make it with minced meat as well. We baked it in the oven, but because summer is here and it's barbecue season, you can even cook these beauties on the grill. And therefore, this isn't a recipe per se, it's merely an inspiration when you make your own. 1. Remove the stem and gills from the portobello mushrooms. Dice and set aside. 2. Cut onion and garlic into small pieces and sauté in oil or butter. 3. Add in gill and stem parts into the pan. Sauté until the water from the mushroom parts have evaporated. 4. Dice tomatoes and slice the green onions and add in to the pan with spinach. Sauté until the liquid has slightly evaporated and the mixture is not overly wet. 5. Add oregano and basil and salt and pepper to taste. 6. Stuff the mushrooms with the mixture, pushing it into the nooks and crannies of the edges. Pat down gently. 7. Heap panko over the mixture and pat gently. 8. 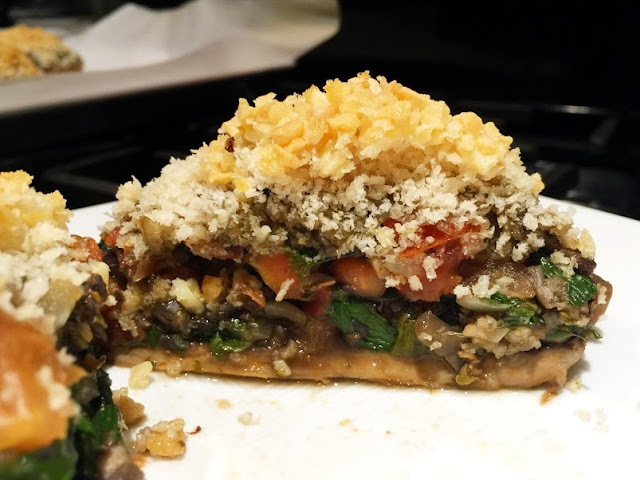 Sprinkle a generous dose of 'parmesan cheese' on top. 9. 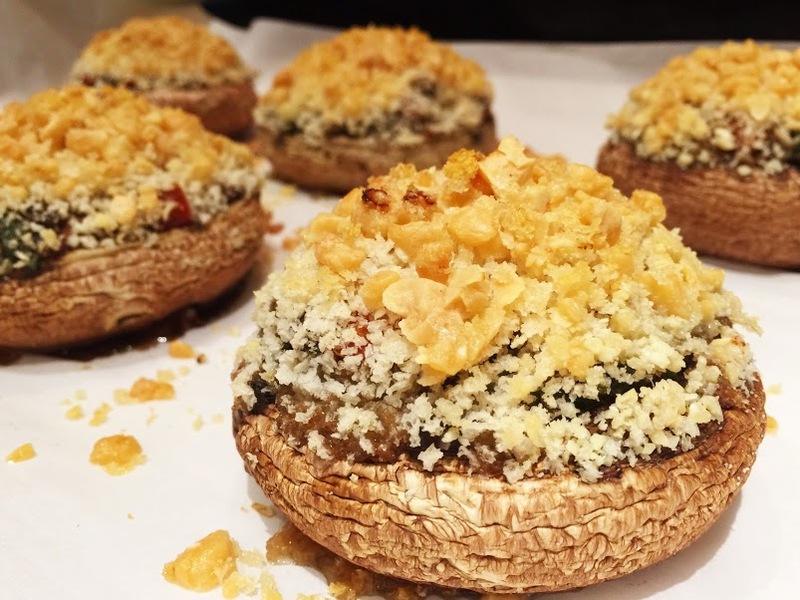 Bake in the oven until the top is golden brown and the mushroom is nice and hot.